In 1953, a Jacksonville, Florida, man named Keith Kramer, along with his wife's uncle Matthew Burns, looked to create a restaurant idea of their own after being inspired by the original McDonald's restaurant in San Bernardino, California. As part of their new restaurant, they bought the rights to a special grill machine called the Insta-Broiler, and named their restaurant "Insta-Burger King." Several years later, the idea had grown into several restaurant locations and was picked up by a pair of Cornell University classmates, James McLamore and David Edgerton. McLamore and Edgerton started by purchasing one Insta-Burger King franchise in Miami in 1954. The growth of the Miami metropolitan area made it an excellent location for starting a new chain, but an adjustment had to be made to further improve on the Insta-Broiler machine. McLamore and Edgerton came up with a gas grill that they called a "flame broiler," and it eliminated the problems of the Insta-Broiler. By 1959 the Insta-Burger chain had grown, but the Kramer-Burns operation had run into financial trouble, and McLamore and Edgerton bought out the entire company to restructure and revitalize its operations. By 1961, the rechristened Burger King and its signature burger, the Whopper, had begun to spread across the United States. In 1978, Burger King poached executive Donald N. Smith from McDonald's. He restructured the company's franchise agreements so that owners could not own franchises in other chains, thus encouraging loyalty; and so that they could not operate stores more than an hour's drive from their homes, thus cutting down on absentee ownership. Many unprofitable franchise owners dropped out, trimming the company's fat. It was at this time that Burger King began to reach out to children, by countering McDonald's commercials featuring live-action versions of its characters Ronald McDonald and his friends with similarly themed characters: a Burger King who was also a magician, the Wizard of Fries, and Sir Shake-a-Lot. Smith took on not only his former employer and Long John Silver's by introducing Burger King's first fish sandwiches, but also Kentucky Fried Chicken and Wendy's by introducing their first chicken sandwiches. Company sales were up 15 percent by 1980, at which point Smith was poached once again, this time by PepsiCo. After he left, sales began to decline. Norman Brinker, who had been brought into Pillsbury when they bought his chain Steak & Ale, was charged with turning the company around. He started what became known as the Burger Wars, running commercials that said Burger King's burgers were bigger and better than McDonald's; these may be the first political-style "attack ads" in the food industry. As with Smith's efforts, Brinker's worked for a brief time before he left the company, and he went on to build the Chili's restaurant chain. 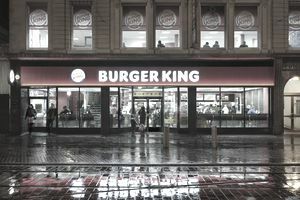 Without Smith or Brinker, Burger King declined again, and this was one of the reasons why Pillsbury was unable to fight off a takeover bid by British company Grand Metropolitan PLC. Already having a worldwide focus, Grand Met changed Burger King's distribution methods, switching their soft-drink contract from Pepsi to Coca-Cola, partnering with the Walt Disney Company to tie in with Disney films, and expanding BK around the globe, partially by buying the company that ran British-based burger chain Wimpy. The company's headquarters building in Miami was destroyed by Hurricane Andrew in 1992, but a proactive response by Grand Met led to a quick rebound. In 1997, Grand Met merged with brewing giant Guinness to form Diageo plc, which seemed to ignore Burger King in comparison to its alcoholic beverage properties, including Guinness, Johnnie Walker, and Moet & Chandon. BK declined again until TPG Capital, with assistance from Goldman Sachs and Bain Capital, bought Burger King for $1.5 billion. An IPO was launched in 2006, generating $425 million in equity proceeds. TPG introduced the Whopper Bar concept, allowing customers in some stores to better see the burgers being made, a concept similar to the Benihana steakhouse chain but more familiar to Starbucks customers, with the workers being named "Whopperistas." The company grew to be worth $3.2 billion, the purchase price that 3G Capital paid TPG for it in 2010. Burger King once again revamped its menus and ad campaigns in 2011 and was doing well enough that 3G Capital took the company public again in 2012. In 2014, the Burger King chain merged with a Canadian chain, Tim Hortons, a Canadian chain of restaurants and coffee shops. With Burger King and Tim Hortons merged 2014, Restaurant Brands was created in December of that year. In 2018, Restaurant Brands purchased Popeyes for $1.8 billion. The acquisition which further expanded the company's menu offerings beyond burgers and donuts and included fried chicken. Over the last several years, Restaurant Brands' goal has been to expand into multiple stable fast-food chains. As of 2018, Burger King has reclaimed the second spot in the burger wars with $9.6 billion in U.S. sales when compared to $9.3 billion in sales for Wendy's for the previous year. McDonald’s is still the leader with $37.6 billion in U.S. sales. Burger King's stock, which trades under Restaurant Brands, has gone from $35 in 2014 to $55 as of 2018 or 57%.